The main fittings are described below. A major feature of the church is the Meering family chapel, to the south side of the chancel, erected in the early 16th century, housing the tomb of Sir William Meering (d. 1537) and decorated with other emblems and heraldic devices relating to the family (see also History), which is described in more detail below. There is a wide variety of smaller memorials, tablets, brasses and plaques from the 18th century onwards. There are also five early 20th century framed panels of embroidery depicting various biblical and other scenes and one larger naive religious painting in an ornate gilded frame (?18th century). Several 20th century framed boards give details of incumbents, the restoration of the church, its possessions and of life in Sutton like one with brass medallions commemorating the Steam Festival held regularly in the village. 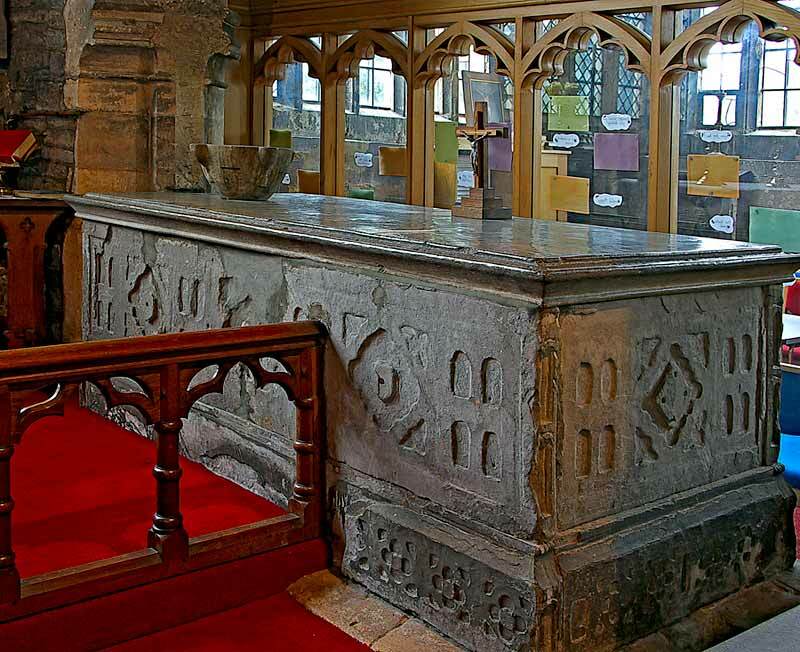 The altar, in the sanctuary, is a table of Jacobean date. A piscina is to be found immediately to the right, formerly serving the medieval altar. 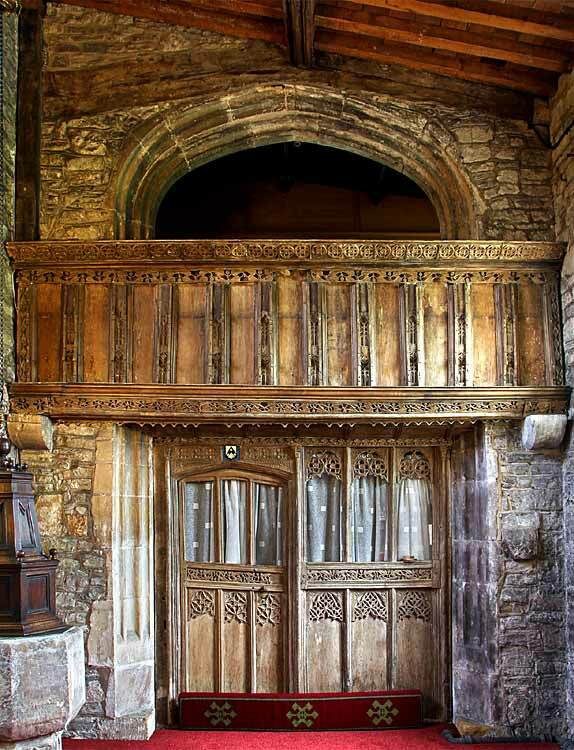 In carved oak consisting of an arcade of ten small Gothic panels (19th century), with two of them forming the gates to the sanctuary. Flanking the east window in the Chancel are two 19th century stone panels, with pointed arches, each with a small multi-colour sculpted cross, inscribed with the Commandments (on the north) and the Lord’s Prayer and Creed (on the south), using the text of the Authorised version. 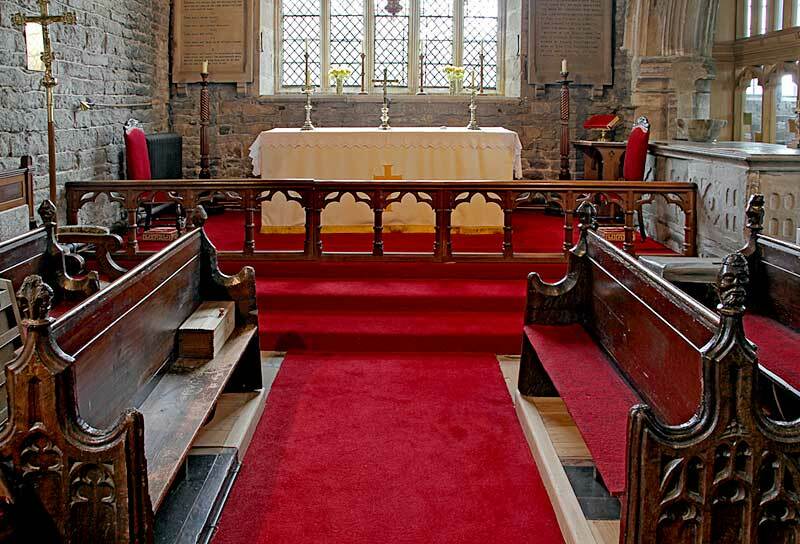 There are two 18th century upholstered chairs with carved backs and stretchers in the sanctuary. 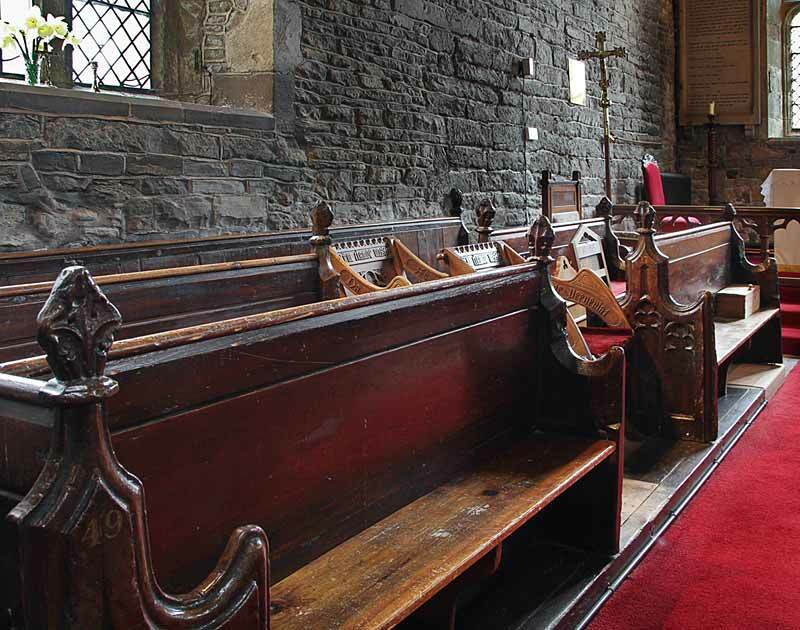 Other chairs include two carved oak arm chairs in an ‘Arts and Craft’ style, each of which carries on the arms the following inscription: Da pacem Domine/Domine eraudi orationem/Nostrum clamor noster/Ad te perveniant/Sit laus Deo [Give peace O Lord/O Lord hear our prayer/May our cry come unto thee/Praise be to God]. 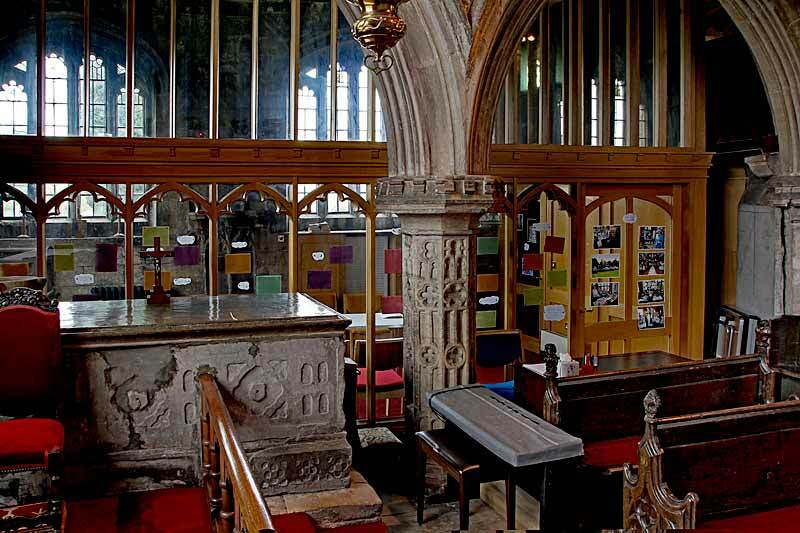 That on the right side at the front of the chancel is in oak with carved tracery and foliage and was given by Lady Elinor Denison of Ossington at the time of the 1902-3 restoration. That to the left is in pine and is plain in form. The main font, which stands at the front of the nave on the south side, has a moulded octagonal base and stem with traceried panels, octagonal bowl and remains of tracery, and dates to the 15th century. It has a handsome late 17th/early 18th century two-tier panelled carved wooden octagonal cover with ball finial, and a brass hook and chain counter-poise mechanism for raising. 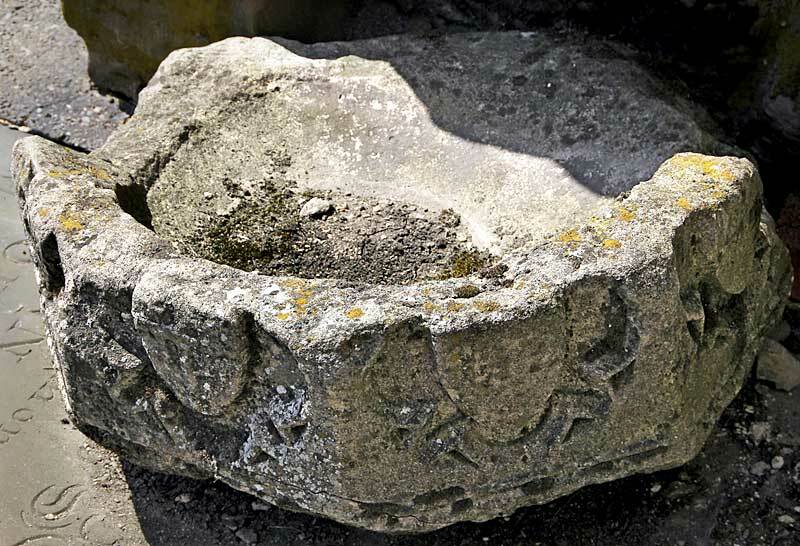 The remains of a second octagonal font bowl, with masks and shields in panels and foliate bosses, can be found outside on the east side of the porch. 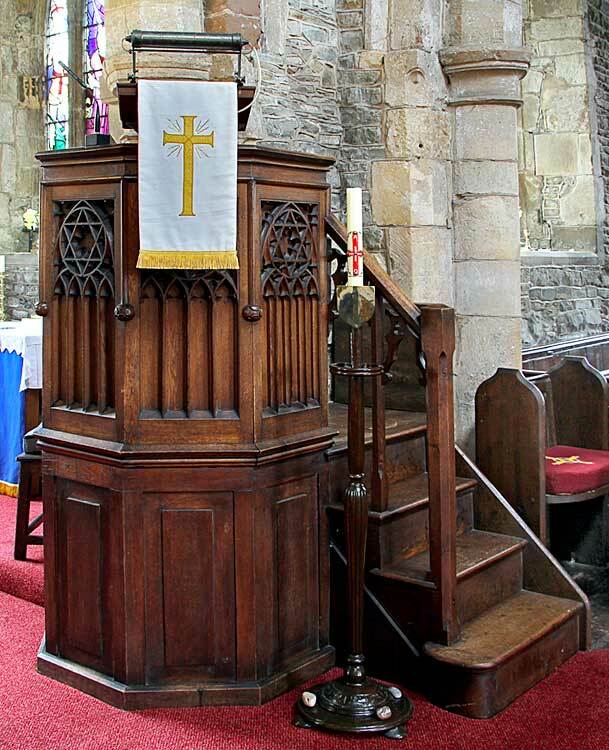 The wooden pulpit, which stands on the north side of the nave close to the chancel arch, is also octagonal in form, standing on a 18th century encased panelled stem (provided at the 1902-3 restoration), with a 19th century traceried panel top. 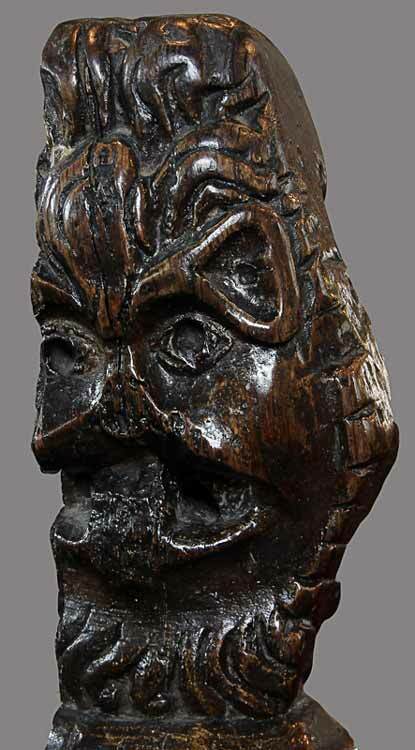 The carved oak 19th century lectern takes the traditional form of an eagle with wings displayed. 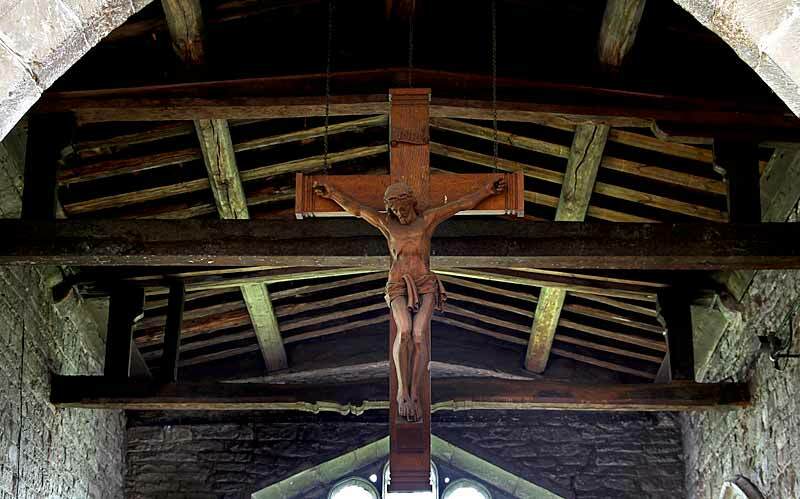 Hanging centrally in the chancel arch facing the nave is a large (approximately five feet tall) wooden crucifixion in carved oak, the installation of which as a memorial to William Bates, vicar 1938-9, is recorded on a tablet affixed to the adjacent south jamb of the arch (see Monuments and Memorials). 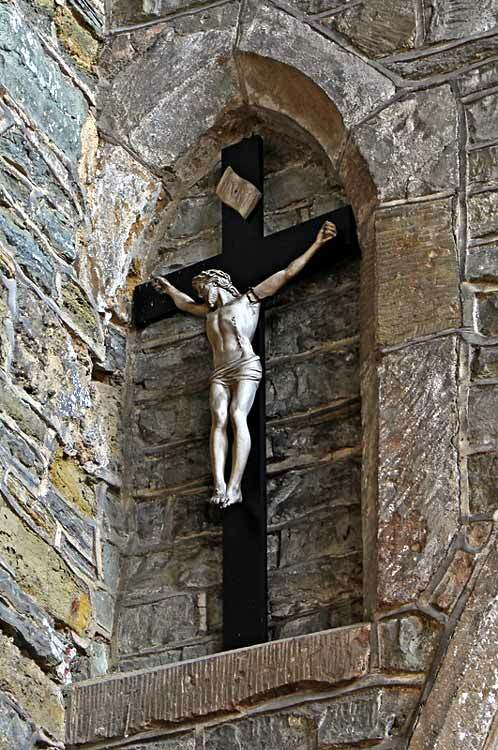 In a niche high up to the north side of the chancel arch also facing the nave, there is a second, smaller crucifixion, a wooden cross and the figure of Christ in ivory. 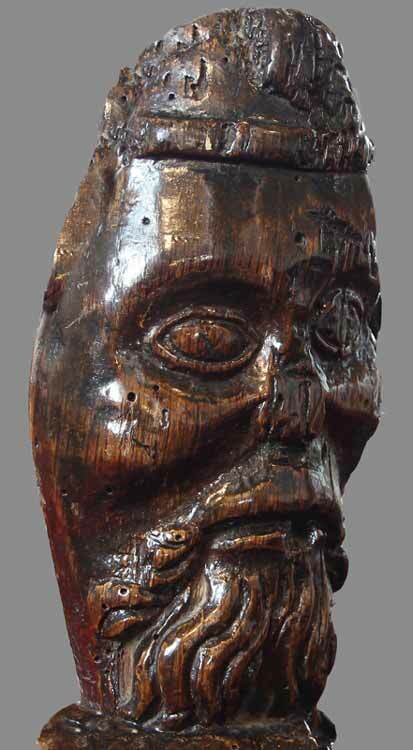 During the 19th century or early 20th century restorations and reorderings, some surviving 15th/early 16th century benches with traceried panels, shaped ends and fleur-de-lys or mask finials were re-sited in the chancel. 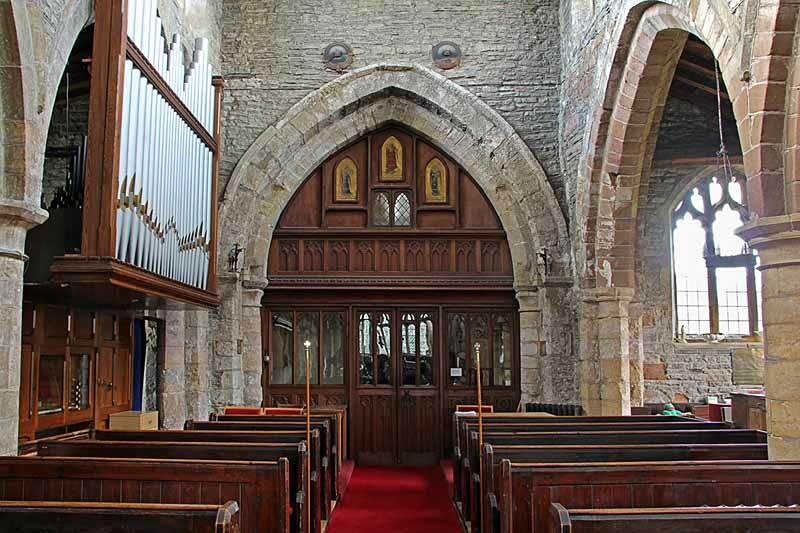 The chamfered and panelled benches in the nave date to the 19th century. All the benches retain their 19th century numbers (e.g. at the front south side of the nave 24-29 and 30-33 at the back; on the north side, front 42-47, 38-40 back; south aisle 7-11; 14 and 69 occupy the north-west aisle corner and 59-64 the front of the north aisle. An oak chest with iron hinges and fittings, hinged-cover divided into three separate sections, probably of late 17th or 18th c. date, currently in the Ringing Chamber of the tower. A heavy, long wooden (?pine/ash/elm) ladder, probably dating to 18th century (cf. Weston-on-Trent) formerly providing access from the Ringing Chamber to the Bell Chamber in the tower. Two tall turned wooden candelabra; one tall turned wooden plant pedestal; one small oak table; one bronze processional cross; two wardens’ wands; one small wooden kneeling desk; one large oak chair with padded arms and seat; one wooden chest; one wooden chest with drawers and cupboards for crockery and table ware. 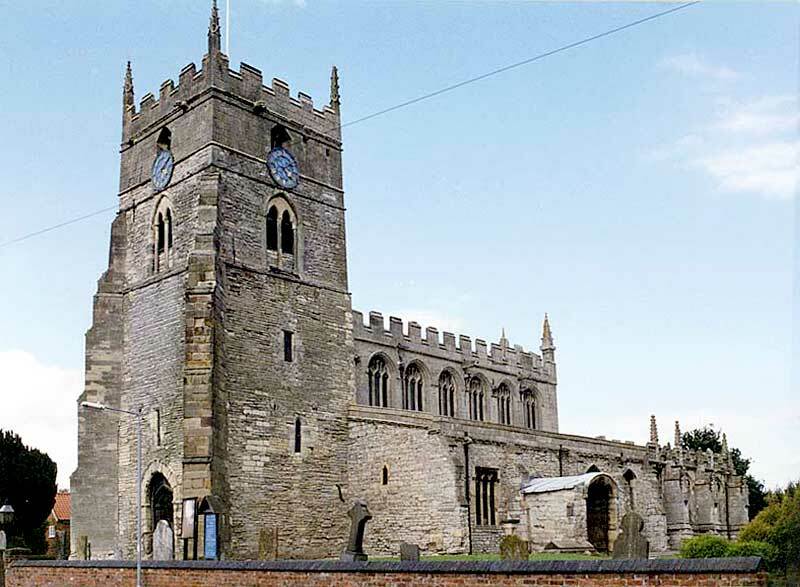 As explained in more detail in the History of the church, a local gentry family, the Meerings (whose name is also spelt in several other forms such as Mering, Meryng and Merynge), and whose medieval manor house lay less than a mile to the east of Sutton, now on the other side of the Trent but before 1296 on the same side as Sutton, chose to build an ornate chantry chapel at Sutton in the early 16th century. In doing so they were copying what another branch of the family had already done in St Mary’s, Newark, where an impressive free-standing chantry chapel was erected around 1500 at the end of the Chancel north aisle, close to the main altar (and balanced opposite in the south aisle by a similar monumental chantry for the Markham family). A nearly contemporary chantry chapel in nearby Holme by Newark erected by the merchant of the Staple, John Barton, may also have provided a model. At Sutton, because of space constraints, it was decided to lengthen the south aisle by adding three bays adjacent to the chancel and sanctuary, to which access was obtained by the construction of a two-bay arcade, of which the central panelled octagonal pier also has a panelled moulded base and octagonal moulded and castellated capital ). The first two bays are of equal size, but the third bay, which contains a priest’s door, is smaller. In this bay a gallery was constructed at mezzanine level. An impressive, carved, wooden 16th century screen with the arms of Meering (Argent, on a chevron sable, three shells or) now separates the chantry chapel from the end of the former south aisle, a central door giving access to the ground floor of the chantry. 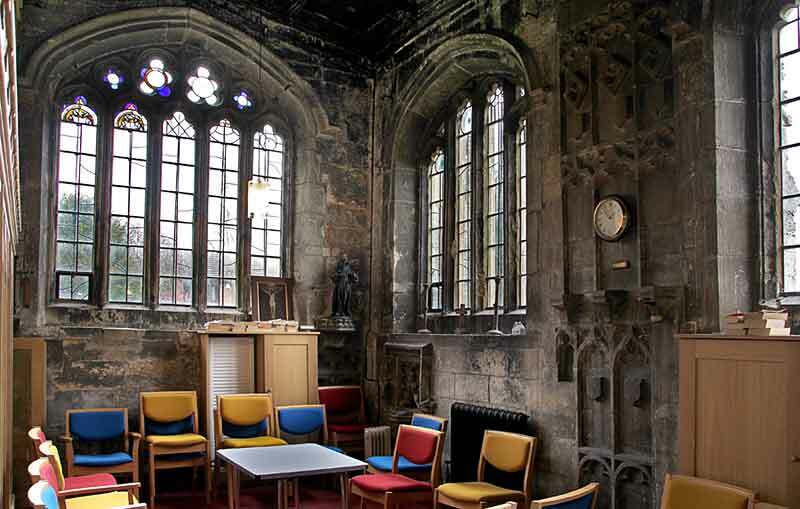 A narrow spiral stair behind the screen gives access onto the original rood loft; this represents the only complete medieval rood screen and loft surviving in Nottinghamshire. Under the arcade bay at the east end of the chancel and in the sanctuary, close to the altar, a large chest tomb with chamfered base, strapwork panels and moulded Purbeck marble top was erected, probably for Sir William Meering (d. 1537) who left money in his will for the refurbishment of the church (see History and below). Sadly, no inscription or effigy now survives. 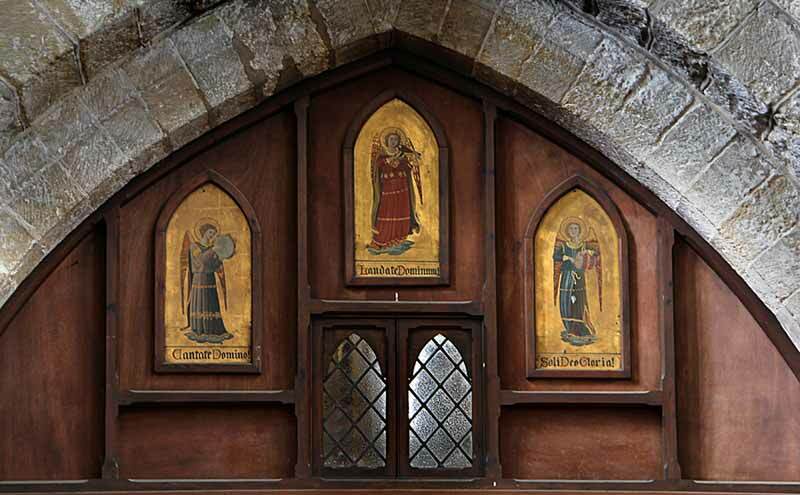 Internally the chapel was originally highly decorated with panels with painted shields of arms and other heraldic devices and it is most probable that its stained-glass windows were also similarly decorated if the few remaining fragments of glass are a fair indication. The chapel has its own ornate corbelled octagonal piscina in a traceried crocketed square panel with hood mould so that a priest could celebrate requiem masses. 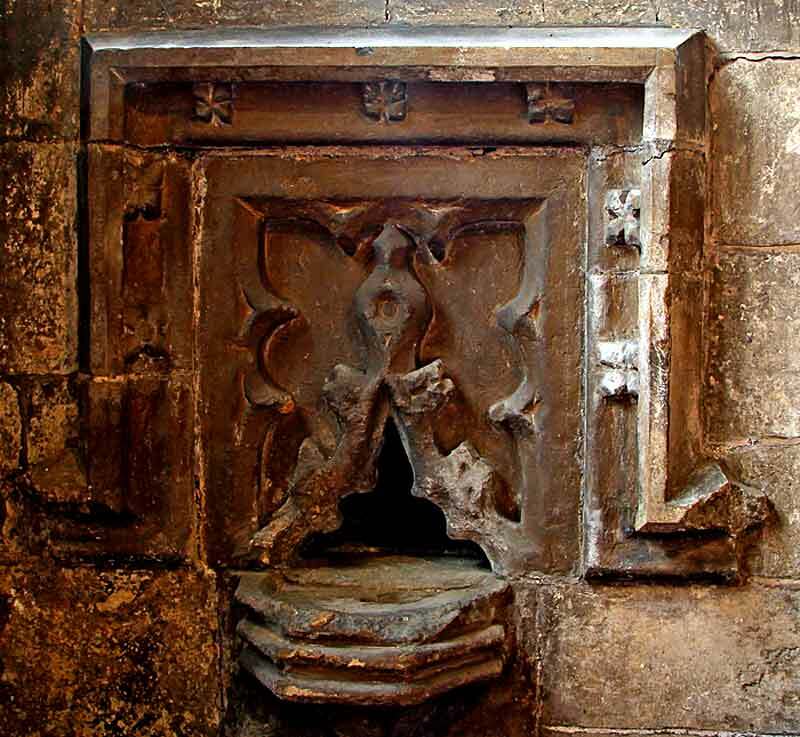 Externally, too, the chapel was extremely florid, with a plethora of heraldic shields, gargoyles and other sculpture. We can assume that it was originally intended that the shields would also be painted though whether this ambitious decorative scheme was ever completed, given the declining wealth and status of the Meerings following Sir William’s death, and the abolition of chantry chapels in the latter years of Henry VIII and Edward VI, remains uncertain. The chapel was apparently incomplete in 1541 when Sir William’s son, John, in his own will left £5 ‘to the buyldinge of the revestrie and of the chapell of Sutton churche that my father dide bequeath by words of mouthe afor the vicare and Sir Hugh and John Merynge’. However, it has survived remarkably to the present, with much evidence of its former grandeur. 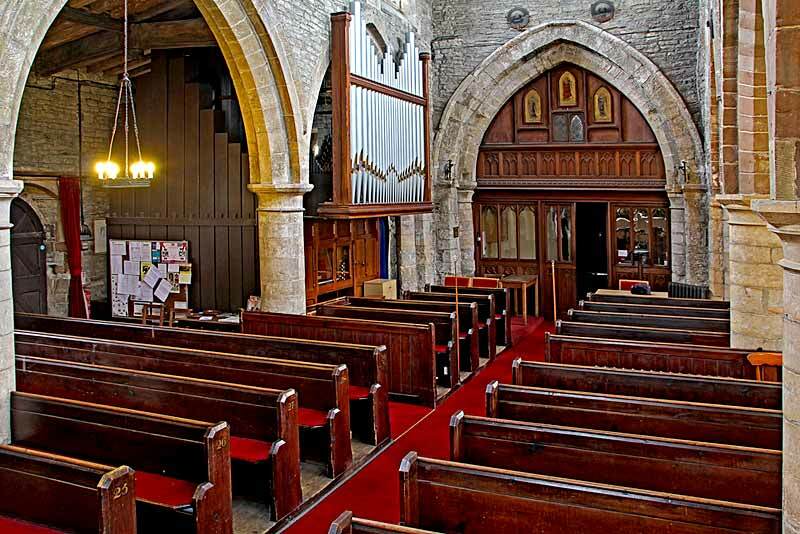 In 2008, it was refurbished for use for small meetings in the church with an appropriately new late Gothic-style oak-panelled glazed screen separating it off from the chancel (designed by Mark Goodwill Hodgson, architect) and the provision of comfortable wooden chairs. Among furnishings, on a niche in the south-east corner, a modern wooden statue of a saint, probably Saint Francis of Assisi.